Can a Cookie Sheet Affect the Baking of the Cookies? Katie Leigh is a freelance writer and editor based in Chicago. A Loyola University New Orleans graduate with a bachelor's degree in communications, Leigh has worked as a copy editor, page designer and reporter for several daily newspapers and specialty publications since 2005. 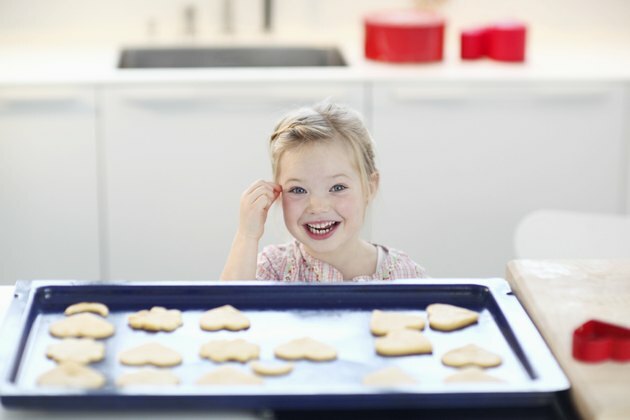 According to experts at Better Homes and Gardens, your choice of cookie sheet can make or break your batch of cookies. In addition to replacing old or warped sheets, pay attention to the material from which your cookie sheets are made. In particular, low fat and fat-free cookies like meringues are quite delicate and susceptible to mishaps if they're baked on certain types of cookie sheets. According to Lauren Chattman, author of "The Baking Answer Book," heavy-duty aluminum cookie sheets are the best sheets to choose when making any cookie. The reflective material allows the cookies to bake evenly without burning on the bottom. This is because thick aluminum conducts heat better than most other types of metal. If you use aluminum cookie sheets, line the sheets with parchment paper or a silicone baking mat to keep the cookies from sticking. Air-cushioned insulated cookie sheets generally yield cookies that are soft and light in color. They rarely burn the cookies and don't require parchment paper or a silicone mat to keep baked cookies from sticking. However, Carole Bloom, author of the book "Cookies for Dummies," points out that cookies baked on air-cushioned insulated cookie sheets often come out doughy in the center and can take longer to cook all the way through. Insulated cookie sheets are not desirable for cookies that should be crisp on the bottom, and you should expect to extend the baking time by at least a couple minutes if you use them. Dark cookie sheets often brown the bottoms of cookies too quickly, leaving them with blackened undersides and overly crispy edges. This is because the sheets' dark color absorbs the oven's heat; these sheets grow much hotter than their aluminum counterparts do. "The Baker's Dozen Cookbook" discourages baking cookies on dark cookie sheets, if you have the choice. However, if they are the only baking sheets available, lower the oven temperature by 25 degrees Fahrenheit and keep an eye on the cookies while they bake to keep them from burning. Nonstick cookie sheets don't require greasing or lining, which makes them a more convenient than other types. However, they may be a poor choice for cookies that should be thin and crispy. Nonstick cookie sheets don't allow dough to spread as much as cookie sheets that have been greased do; this results in a more rounded, cake-like cookie. How Do I Make Mini Puff Pastry Shells? How Many Calories in a Fortune Cookie?